Is the reason so many change initiatives fail an excessive focus on the ‘technical benefits’ and future value? Some of the lessons from the Brexit campaign would suggest ‘YES’! Firms that want to export to Europe will have more bureaucracy to deal with, complying with both the UK rules and the EU rules (the alternative is to cut off 50% of your export market). EU bureaucrats – the unelected and unaccountable masses in Brussels! This ignores the fact UK bureaucrats are unelected and both sets are accountable to their respective parliaments. However, the perception of lack of control and accountability was significant despite the fact 99% of the UK electors have no control over UK bureaucrats. The vast majority of Islamic migrants in the UK arrived before the UK joined the EU (or these days their parents arrived…). Until the 1960s Commonwealth citizens had UK passports and a right of residence in the UK. The EU is less than 5% Islamic. Freedom to work in the EU is a two-way process – the right to work and access to workers is important (and has virtually nothing to do with ‘immigration’). Trade deals. Negotiating ‘trade deals’ to the benefit of the UK….. Ignoring the fact that any trade deal requires concessions and most take 5 to 10 years to negotiate. The ‘other party’ has to see a significant benefit. The positive lesson for change proponents is to spend more time on creating the desire for change. Most people in an organisation can ‘live with’ the status quo (but are aware of the problems and pain points), and are likely to be frightened with the perceived threats and challenges of the proposed change. Digging into the ‘pain points’ and offering constructive solutions may provide a powerful basis for building the desire for change. This is a very different approach to starting with an emphasis on the future benefits and opportunities the proposed change will bring. The processes needed to sell the change to the organisation’s executive decision makers have to focus on benefits and value, but Brexit suggests a different approach may be beneficial when approaching the people within the organisation affected by the change. Ethics matter! “You can fool all the people some of the time and some of the people all the time, but you cannot fool all the people all the time”. What has yet to wash out in the Brexit aftermath is the lack of ethics and in some cases blatant dishonesty of the ‘Leave campaign’. I suspect there will be a major backlash against the people responsible for the ‘Leave campaign’ as people become aware of the exaggerations and deceptions. The current crash in the Pound and the almost inevitable recession it will cause were predicted. What was missed from the UK debate, and is essential in an organisational change initiative, is recognition of the challenges of the change – offset by the vision of future benefits. Ethics are not negotiable! Simple language is important. Creating and emotional commitment to change requires the use of language that is easy to understand. The ‘Leave vision’ was simplistic rather than simple but it worked – ‘make Britain great again’ and ‘regain sovereignty’ sound appealing but lack substance. The difference between the Brexit ‘con job’ and ‘informed consent’ is understanding what you are committing to, both the vision and the journey. But the language of projects, engineers and technicians used to define and develop a change proposal is frequently inappropriate for effective communication to the rest of the people affected. This is discussed in my paper: Understanding Design – The challenge of informed consent. The Brexit campaign is an extreme example of creating a desire for change based on developing a level of dissatisfaction with the status quo. 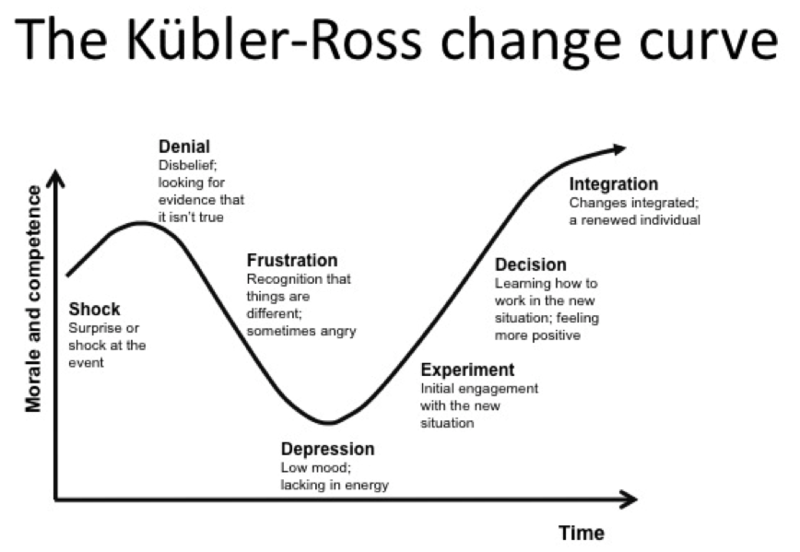 This tactic can be a very useful early phase in the communication processes around a proposed organisational change – dissatisfaction with the current state is a powerful driver to accept change. The flip side, also observable in the Brexit campaign, is that ethics and honesty matter. Democracy requires informed consent! We have no idea what the consequences in the UK would have been if the ‘Leave campaign’ had been more ethical and spelt out a future; but judging from the reaction of many, large numbers of people now seem to feel conned by the ‘leave’ campaign. In an organisational context, this loss of trust will be disastrous. However, the fact the ‘Leave campaign’ could persuade a majority in the UK to vote in favour of an uncertain future that will reduce living standards and increase costs in the short-term (at least) without even bothering to paint a clear vision of their proposed future (or how to get there) shows how powerful the techniques discussed above can be. The challenge for ethical organisational change is to harness the power without resorting to the deceptions. Britain was ‘Great’ in the period leading up to WW1 based on its Empire (not the Commonwealth); it is and has been a sovereign nation since 1066…… Neither of these concepts was fleshed out possibly allowing 1000s of different self-made visions to fill the space. Potentially a good tactic but fraught with problems going forward. 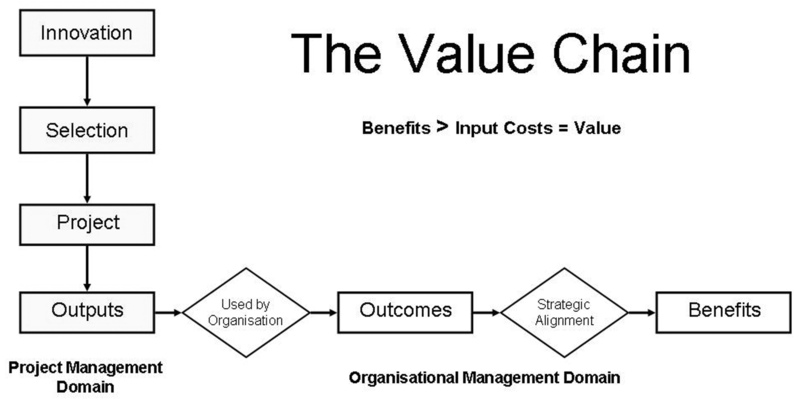 The effect of the ‘chain’ means that when you have got to the end of the project (or program) all that has happened is you’ve spent money, benefits and value come later and need a ‘team effort’ from all levels of management to be maximised (read more on Benefits Management). But none of these well established concepts really explain why some organisations are open to change and others are not; the question this post is focused on. The paper suggest that the Darwinian view that competition among firms reflects the ruthless logic of ‘selection of the fittest’, where the free market is a struggle for survival in which successful firms survive and unsuccessful ones die, is only partially correct. The application of Darwinian selection to competition among firms (as opposed to among individuals) invokes group selection, which requires altruism and the suppression of individual self-interest to the benefit of the ‘greater good’ of the group and the advancement of the firm. This effect can be achieved in circumstances where the organisation is lead by a charismatic leader who can inspire the members of the organisation to sacrifice their short-term self interest to the ‘greater good’. Or when the members of the organisation are either inspired by the organisation’s mission (eg, committed workers in many aid organisations) or feel the organisation is threatened and that sacrificing their short-term best interests to help the organisation survive is essential for everyone’s long term good. These types of situation create the same effect as a ‘high performance team’ – individual team members ‘play for the team’ ahead of any selfish interests. If any or all of these factors are in play, and are appreciated by the individuals that make up the organisation, the ability to implement change is significantly increased (provided the change can be seen to contribute to the mutual good / mutual survival). However, if the members of the organisation feel the organisation is fundamentally impregnable, there’s no threat (or common enemy) and no inspiring mission, a completely different dynamic come into play. The competition and Darwinian ‘survival of the fittest’ plays out at the individual level. What matters most is how the proposed change will influence existing power structures and networks. To most people the change is likely to be perceived as a threat; they know what the status quo is but can only imagine the future state after the change and will generally imagine the worst case due to our innate biases. 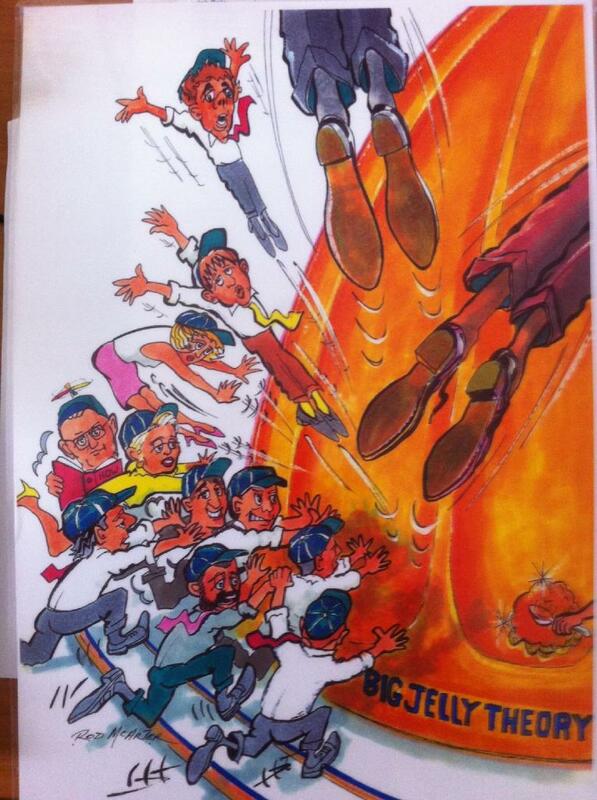 And consequently the change has to be resisted – the normal ‘change management challenge’. Some inspirational organisations seem to adapt to change easily, 3M and Apple spring to mind, a combination of inspirational leadership and a strongly believed mission to create new things. However, in many established large organisations in both the public and private domains, the link between the individuals well-being and the organisations well-being is less clear and entrenched self-interest takes over. The well known ‘office politics’. So how can a change agent overcome the entrenched inertia and covert opposition experienced in the change resistant organisation? Short of generating a massive crisis (eg, the General Motors reorganisation) most change initiative will fail if they are not carefully managed over a sustained period. The Big Jelly Theory, postulates that large or very large organisations are extremely difficult to change, but it is not impossible to do so. The problems change agents often encounter are caused by the approach chosen to effect the required organisational changes. Paul’s theory is that if you throw yourself and your team members 100% mentally and physically at the organisation in an attempt to force it to change at best the organisation will giver a little shiver, momentarily, like a giant jelly, and then immediately return to it’s pre-existing shape and carry on with business as usual as though nothing has happened. The theory postulates that the only effective way, to change or realign an organisation, is to metaphorically issue each of the change team members with spoons. The team members then use these spoons, to sculpt away at the big jelly, and in doing so changing the organisations shape, to whatever has strategically been deemed as more desirable, for the future. In other words whilst effort and enthusiasm are important, in making or reshaping organisational changes they are very often ineffective when used alone. Whereas the spoon approach, whilst often time consuming, yields discernible result almost from the start. 6. Identify small moments of success. Provided you have the overarching ‘grand vision’ to coordinate and align the small changes, the results can be amazing!!!! It just needs time, perseverance and really effective long-term stakeholder management which is where tools like the Stakeholder Circle® come into play. We are at the end of a long lazy ‘members weekend’ enjoying the hospitality of our favourite local winery Pfeiffer’s of Rutherglen. Reflecting on the discussions around their range of fortified wines and the way modern business and projects are focused raises an interesting paradox. When you are taught to drive fast, the key lesson is the faster you go, the further in front of the car you need to be ‘driving’. Quick reactions are not enough, you need to be planning and positioning the car now to be in the right place to two or three curves down the track. Modern business is going faster and faster and pressures are on projects to complete quicker and better but unlike racing drivers, no one seems to be planning ahead – if there is a panic on the current project, everyone forgets about transiting staff onto the next project sensibly. Rather than optimising the overall outcome to benefit the business ‘down the track’, the short term focus outweighs the long term benefits and produces suboptimal results. This destructive short term focus is encouraged because most business management and directors seem to concentrate on satisfying the demands of short term speculators rather than the needs of the organisations stakeholders. Commercial companies are driven by the needs of the high speed traders operating second by second, day traders and other short term speculators who are only focused on movements in the share price, not the long term health of the organisation and its ability to meet the needs of the majority of its stakeholders. Consequently, the daily and quarterly share price movements seem to mean more than long term plans future growth. A classic example is the regular announcement by major corporations that they are sacking 100 or 200 staff. This creates an immediate boost in the share price and makes management look good to the short term speculators whilst destroying the organisations relationship with all of its staff. In reality, the monthly staff turnover is more than enough to make this type of adjustment in a smooth way that looks after the interests of this group of key stakeholders, the employees that actually do the work needed to allow the organisation to operate. But few managers seem to even ask what’s more important – share movements over the next couple of days or maintaining and enhancing the relationship with the organisation’s “most important asset”, its people??? Apparently the speculators win every time in the mind of management. The situation is not much different in government organisations where the focus seems to be a combination of the 24 hour news cycle and short term personal advantage, a focus on ‘petty politics’ rather than long term policy and the good of the organisation. Different drivers but the same outcome, a prioritisation of immediate gratification over long term best outcomes. But what has all of this got to do with fortified wines?? The ‘Rare’ classification is on average 23 to 24 years old. But the average age is misleading, all four classifications include some of the original blend created 30 or 40 years ago, that has been topped up and enhanced every year since. Obviously there is a far higher percentage of old wines in the ‘Rare’ compared to ‘Rutherglen’ classification but all of the wines have the same origins. In short, the characteristics of the current wine are based on decades of decisions ranging from how to manage the vines and the vineyard, how to develop each barrel of wine and what to add to the residual ‘base’ carried forward from last year to create each year’s release across all four classifications. The decisions of 5, 10 and 30 years ago have an influence on the wines of today which puts a relatively new winery like Pfeiffer’s at a disadvantage when competing with some of their Rutherglen neighbours such as the Morris family who have stocks that have been developed over more than 100 years. The current generation of winemakers do not see themselves so much as the ‘owners’ of the current stock of fortified wines, rather the custodians of a heritage that they hope will go on developing and improving for generations into the future. This is true of all types of blended fortified wines and is one of the reasons old world wine regions such as the Ports of Portugal and Sherries of Spain have characteristics that are hard to replicate in newer countries such as Australia that only have 100 to 150 years of development. In many ways organisations are similar to a wineries stock of fortified wine. The current group of managers are the custodians of a complex set of capabilities, facilities and cultural beliefs, behaviours and relationships that have been created by the thousands of decisions and actions made by their predecessors and their decisions will create the organisation that will be passed onto their successors. For example, a new ‘culture change’ initiative by current management does not start from a blank canvass, the outcome will inevitably be coloured by everything that has gone before that has created the current culture, and will inevitably influence everything that happens later. It is impossible to erase the past without erasing the organisation! The paradox is that far too many managers seems to act as owners with a focus that extends days or months into the future and their directors look at reports focused on the past, whilst the organisation needs a focus that is long term and future focused to meet the needs of its stakeholders. Perhaps a weekend at a winery that produces a world class range of fortified wines could pay real dividends….. Managing Benefits will require a couple of posts over the next couple of months to cover the depth of information available to organisations to achieve the best return on their investments in projects and programs, and my contribution to the Benefits Realisation Summit was focused on understanding the links between stakeholders, the overall value chain, and the organisation’s project delivery capability (download the presentation). The output from the project to build the shop is a fitted out facility. The outcome from the staffing and stocking of the shop is a shop selling goods to customers. The benefit realised from the shop is the monthly profits from sales. The value created by the new business is its potential ‘sale price’ which is usually calculated as a multiple of the annual earnings (typically somewhere between 5 and 12 times the annual profit). The chain starts with decisions around the type of shop, its location, size, etc. The overall value chain is discussed in The failure of strategic planning and the front end processes in Linking Innovation to Value. Once the optimum project has been selected, the organisation then needs to be capable of efficiently delivering the project and creating the required output. Project Delivery Capability (PDC) is discussed in White Paper WP1079. 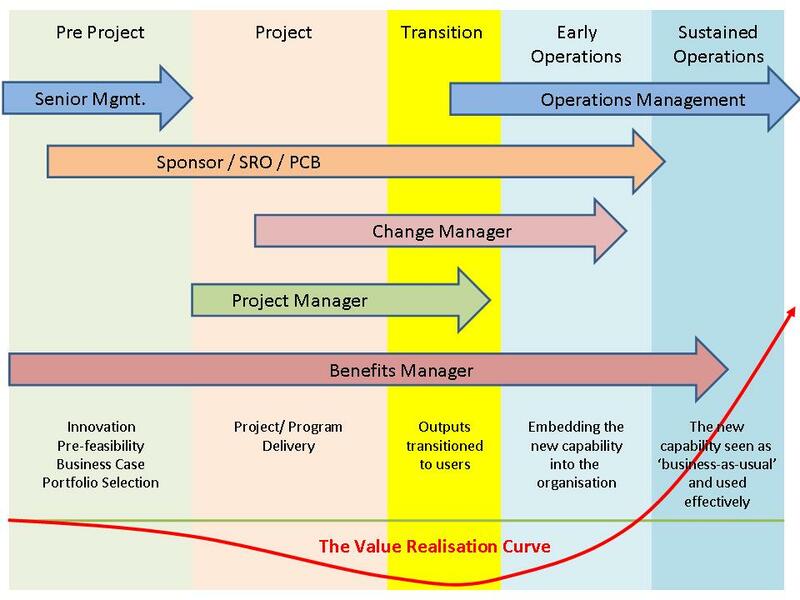 Once the project’s outputs are created, the requirement to make efficient use of them within the organisation requires effective organisational change management; this facet of the value chain is discussed in WP1078. Then, assuming the original concepts used in the business case were accurate, the intended benefits are realised and value is created. Within all of these stages, the key to creating the intended value is effective benefits management; this is the focus of the Managing Benefits book and the objective of the Benefits Realisation Summit. Once the project has transitioned its output into operations, the senior management group responsible for the operation of the organisation’s business-as-usual processes need to make effective use of the deliverable to realise benefits and as a consequence, generate the intended value. The Sponsor is the senior manager responsible for taking ownership of the business case, approving the Project Charter once the organisation has agreed to fund and resource the project and ensuring the project’s outputs are effectively transitioned into operations and used effectively. The role of the sponsor is discussed in WP1031. From a benefits realisation perspective, the Sponsor (or Senior Responsible Owner – SRO) is the manager with primary responsibility for ensuring the intended benefits are realised. The sponsor may fulfil the role of benefits owner personally, or liaise with the designated benefits owners to ensure the benefits are realised (the benefits owner is the person responsible for the realisation of a specific benefit). The Change Manager responsible for managing the organisational change needed to make use of the new product, process or service. The role of the Benefits Manager is partially advisory, and partly an assurance role. The Benefits Manager should be responsible for developing an effective set of metrics supported by a system for identifying and measuring benefits (planned and realised) and should also be responsible for validating the realised benefits (see more below). Change management and project management are different skills requiring different training and different personality types. Both roles are critical and should support the sponsor in achieving the best possible transition of the project’s outputs into operations. During the life of the project the project manager is assisted by the change manger to ensure the project delivers the most useful output, the change manger also works on preparing the organisation for the change. The focus is creating the ‘right’ outputs as efficiently as possible and this is primarily a project management function. During the critical transition phase the focus changes, the project manager’s role should shift to focus on helping the change manger to ensure the projects deliverables ‘work’ in the organisational setting. The project manager will also be working on project closure during this period but this should be secondary to ensuring the planned benefits are capable of being realised. 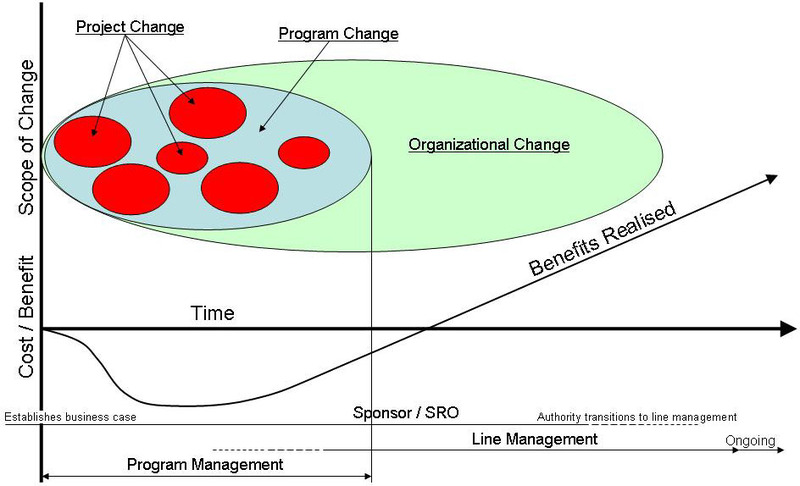 Throughout the whole process, the change manger is primarily responsible for facilitating the organisational change aspects of the initiative including of all of the processes involved in embedding the new product, process or service within the organisation and supporting its adoption through to the point where it is functioning as a normal part of the organisation’s ‘business-as-usual’ capabilities. This may require some level of support for two or three years after the project has finished. Programs are created to manage the work of several projects in a coordinated way, may include some operational work for a period and many are set up specifically created as organisational change agents. The different types of program are outlined in WP1022. If a project is a component of a program, the program manager is responsible for creating the project and is usually acts as the project’s sponsor. The program is responsible for the change management processes as part of its core integration and coordination functions and the program sponsor has overall responsibility for the return on investment in the program. Develop, maintain and progressively enhance the benefits measurement system used by the organisation. Provide scrutiny of each business case to assure the organisation the benefits claimed are realistic and achievable within the proposed timeframes. Lead the benefits identification and mapping processes for project and programs. Assisting with the development of the benefits realisation strategy and plans for projects and programs. Help with the identification and optimisation of additional benefits, dis-benefits and assess the impact of changes from the benefits realisation perspective. Tracking and reporting on the actual realisation of benefits by the organisation. This is an important role both from the facilitation perspective and the assurance perspective. People with a vested interest in the value of benefits proposed or realised should not be the people measuring their value; this is an untenable conflict of interest. The Benefits Manager provides independent assurance that the benefits proposed in the benefits realisation plan have been achieved to the extent defined in the plan, at the time defined in the plan and any variances are identified and explained or understood. For more on assurance see WP1080. Benefits cannot be managed directly; they are a consequence of other management actions and decisions. An organisation will maximise the benefits actually realised by maintaining a focus on benefits from the early stages of project initiation right through to the point where they are fully realised by the operations of the changed organisation. Projects and programs are the key organisational change agents for creating the capability to improve productivity through new systems, processes and facilities. But only if sensible projects are started for the right reason. Declines in productivity seem to be widespread. In Australia, labour productivity in the market sectors of the economy increased at 2.8% per annum between 1945 and 2001, reducing by 50% to an annual rate of 1.4% between 2001 and 2001. The measure of Labour Productivity is the gross value added per hour of work. The ‘market sectors’ measured exclude public administration, education and healthcare where measurement is almost impossible. Some of this change can be attributed to macro economic factors, there were massive efficiency gains derived from the shift from paper based ‘mail’ and copy typist to the electronic distribution of information, improved global transport systems (particularly containerisation) and the restructuring of manufacturing post WW2. These massive changes in the last half of the 20th century are not being replicated in current. Whilst this decline in the rate of improvement in labour productivity is significant, the capital inclusive index is a more telling statistic. The multi-factor productivity index which includes the capital invested in production, giving a purer measure of the efficiency with which labour and capital are combined to produce goods and services. In the six years leading up to 2001, this measure of productivity grew by an average of 1.5% per annum, in the decade between 2001 and 2011 this reversed and productivity fell by 0.4% per annum. Around 40% of the decline in the last decade can be explained by massive investments in mining and utilities that have yet to generate a return on the capital invested. The other 60% represents the massive cost of ‘new capabilities’ in general business for relatively small, or no improvement in productivity. One has only to look at the ever increasing number of ‘bells and whistles’ built into software systems ranging from high definition colour screens to features that are never used (and the cost of upgrading to the ‘new system’) to understand the problem. 90% of the efficiency gain came with the introduction of the new system many years ago, the on-going maintenance and upgrade costs often equal the original investment but without the corresponding improvement in productivity. Another area of ‘investment’ for 0% increase in productivity is compliance regimes. Whilst there may be good social arguments for many of these requirements, the infrastructure and systems needed to comply with the regulations consume capital and labour without increasing productivity. In Australia general management have been rather slow to appreciate the challenge of declining productivity, the impact being cushioned by a range of other factors that helped drive profitability. But this has changed significantly in the last year or so. There is now an emerging recognition that productivity enhancing organisational change is an imperative; and smart management recognise this cannot be achieved through capability limiting cost reductions. Achieving a viable balance across all four areas will require an effective, balanced strategy supported by the efficient implementation of the strategic intent through effective portfolio, program and project management capabilities that encompass benefits realisation and value creation. The ability to develop a meaningful and practical strategic plan. An effective Project Delivery Capability (PDC); see: WP1079_PDC. An effective Organisational Change Management Capability; see: WP1078_Change_Management. Improving productivity is a major challenge for both general management and the project management community; and the contribution of stakeholder management and project management to the overall effort will continue to be a focus for this blog. Firstly, any significant change is a change to the organisation – projects and programs cause the change but the organisation has to adapt to the change. Secondly, the only valid purpose for a change is to create value and the only way to generate value is through sustained improvements (changes) in the way the organisation operates. If you don’t like change you had better get used to irrelevance! By 2006, of the approximately 60 highly successful companies listed in ‘In Search of Excellence’ (1982, Tom Peters & Robert H. Waterman, Jr.) and ‘Built to Last’ (1994, Jim Collins & Jerry Porras), only 33% remained as high performers (source: Beyond Performance, Scott Keller & Colin Price). Of the rest, 20% had ceased to exist and 47% were struggling. The message from ‘Beyond Performance’ is that focusing on current performance such as return on capital is never enough. The primary driver for long term success is focusing on the health of the organisation, supported by performance. Sustained excellence needs an organisation that has a vision of a medium and long term future as well as performing effectively in the current environment. This requires investment in change to meet those futures with no guarantees the investment will pay off, in the short-term, or at all. A ‘healthy’ organisation has a clear sense of direction, inspirational leadership and an open and supportive culture of shared beliefs. Within the organisation, the people are motivated and empowered to take responsibility and accept accountability for their work, within a coordinated and controlled environment that deals effectively with risks, issues and opportunities. The organisation is effectively governed and designed by its leaders to execute strategy effectively; it is outwardly focused on a wide range of stakeholders and most importantly, creative and innovative. But innovation is not enough; the key enabler of sustained excellence is the ability to implement change! This requires good project capabilities to transform innovative ideas into the elements needed to enable the change such as new processes, products or procedures, supported by the ability to implement the change effectively within the organisation to realise the benefits. There is no magic formula for this; different styles of leadership can be equally effective. However, what is certain is that organisations that don’t create the ability to continually change and grow quickly fade into irrelevance as the world around them moves on. This applies equally to private sector companies and government departments and agencies – there are very few government processes that can’t be privatised, commercialised or simply abandoned if the public service executive don’t rise to the challenge. Australia Post makes a profit for the Government; the Royal Mail in the UK carries far more mail over far shorter distances with a far greater population density and charges far more for its stamps but despite all of these advantages is only marginally profitable through the sale of property assets – guess which organisation’s future is in serious doubt! All types of organisation need to embrace the ability to change or the cultural inertia I’ve been discussing in a series of posts over the last few weeks will have its inevitable consequences sooner or later.